The joining of guitar legends Jack White, Jimmy Page and The Edge, is a pretty cool concept and a brilliant entry point into this metaphorical examination of the effect of this one instrument on music and the creativity of its artists. Music aficionados will certainly appreciate the rock significance of the event, though I’m not sure complete Zeppelin/White Stripes/U2 virgins will fully engage with this admittedly fan-centric subject matter. In a large high ceiling studio in Hollywood, Oscar-winning documentarian Davis Guggenheim (‘An Inconvenient Truth’) and producer Thomas Tull (‘The Dark Knight’) set up an intimate meeting room for these legendary musicians. 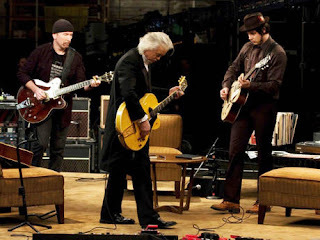 They represent three generations of rock royalty – Jimmy Page, the leader of the legendary hard rock outfit Led Zeppelin, The Edge, the compassionate and often soft-spoken guitarist from U2 and Jack White, the Detroit-born leader of the White Stripes, and now Nashville-based chameleon of punk and the blues. What happens if you put three great guitarists in a room with some guitars, some amps and a few record players? It’s a no brainer that a pretty cool discussion will arise about their creative sensibilities, their influences and funny anecdotes will result. Some of the more interesting stories which emerge include Jimmy Pages’ return to the country home where Led Zeppelin’s fourth album was recorded. It appears to be the first time he’s returned to the place since they recorded those great songs and the emotional reaction on his face is genuine and we feel it too. The Edge describes poignantly the effect of early punk on his career and the growing violence in Northern Ireland as inspiration for some of their best work. I’m always absorbed watching great artists uses their tools to build their masterpieces. And so it’s the Edge’s deconstruction of his technical process which is the most fascinating. Jack White comes off as the elusive pupil to Page and the Edge. Though his desire to scour the history of music for inspiration is genuine, he seems the least down to earth, portraying some kind of Bob Dylan-like caricature of an artist than his real self. Or maybe he really is just a crazy weird-artist who pretends to mentor an 8 year old version of himself. There’s no doubt he’s got talent and the mere sight of him constructing an electric guitar from a coke bottle, a string and a plank of wood is fascinating and headshakingly creative. Guggenheim admirably avoids the A&E Biography template of career charting documentaries. Each one gets to demonstrate one of their songs being played to the others on stage. We learn of each of their humble beginnings and each of their historical influences and creative sensibilities. Even though the narrative throughlines are kept in tact, and evened out between the three guitarists, Guggenheim keeps an improvised and unpredictable feel, anchored by the unrehearsed spontaneity of the three artists. For good or bad, it’s a wholly celebratory affair, each one taking turns acknowledging the greatness of the other, and nodding their heads without a whimper of conflict or question. But really, conflict is overrated. PS. One of the indications of my absorption into this movie is that I actually watched all of the delete scenes which were just as enjoyable as anything in the movie. So The Biracy Project opened it's doors today. It's a social experiment whereby members can get paid to participate. When you buy a membership and refer people, you make money and at the same time finance a feature film that you have a say in. A film you help create through voting and participation ie: subgenre, storyline, sub plots, casting, wardrobe, locations, catering menu, storyboards, posters, ect. The idea is to take the studio system out of the picture and let the crowd create the movie, while getting paid to do so. Kind of like a 20 million dollar choose your own adventure. At the end, with word of mouth promotion amoung members of the site, the money made becomes a media currency that can only be used to put toward other movies, thus creating a sustainable film cycle. Biracy is trying to turn the pirate into the buyer for better content created by the crowd itself. You need a referal code to sign on, but there is a lot of money to be made and a chance to join the revolution in film financing. Check out the link below for a code to play!